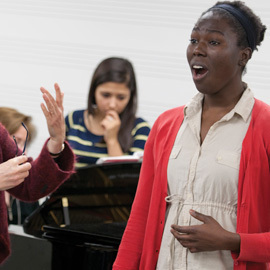 If you’ve completed an undergraduate degree or diploma in music and want to continue improving as a performer, Laurier’s diploma in Opera is a perfect fit for you. This one-year (two term) program offers focused instruction in voice and opera to help you hone your existing skills and develop new ones. You’ll get to work with the renowned faculty and instructors in our Faculty of Music who will help take your performance and knowledge of the craft to the next level. In addition to improving your singing, you’ll have the opportunity to work with prominent stage directors and receive instruction in movement, acting, stagecraft and makeup. You’ll learn from and collaborate with faculty and instructors who are among the most distinguished scholars, performers and educators in Canada. For over 40 years, Laurier’s diploma in Opera has enjoyed a fine reputation as a training ground for advanced pre-professional opera and music theatre singers, directors and repetiteurs. Our many alumni who have gone on to achieve great success in music include Theodore Baerg, Kathleen Brett, Keith Boldt, Donna Ellen Trifunovich, Ruth Ohlmann, Steve Horst, Erica Huang, Adam Luther, Daniel Cabena and Juno Award winner Jane Archibald (BMus ’99), who has sung with the likes of the Vienna State Opera, the Metropolitan Opera, the Paris Opera, La Scala Milan and the Berlin Philharmonic. Opera Laurier performs a program of operatic excerpts every fall and a full-length opera every winter. An undergraduate degree or diploma in music. Completion of the following prerequisite courses: MU298: Introduction to Opera, MU490: Practical Study, and two first-year (or equivalent) language courses in French, German, Italian or Russian (or permission from the dean). Our alumni have gone on to perform in some of the world’s top opera companies or teach at high-profile institutions around the globe.